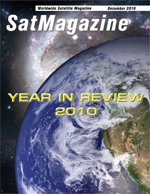 Welcome to SatMagazines 2010 Year In Review issue. This has been one heckuva year, with a variety of challenges which our industry has managed to surmount, some more successfully than others. Weve witnessed acquisitions, mergers, aand new partnerships as well as a broad range of market segment moves, new products and technological synergies that will require time to implement before determining their results  so stay tuned again next year for our Year in Review 2011. In Memorium	, Dean Olmstead, president of EchoStar Satellite Services L.L.C. We are going to examine the use of wide bandwidth oscilloscopes to directly measure and analyze X-, Ku-, and Ka-band radar and SATCOM transmitter outputs up to 32 GHz. The Asia Pacific region continues to challenge and intrigue the satellite industry, as it has for the last several years, if not decades. AsiaPac is home to more than two dozen global, regional and national satellite operators, a number that has been little changed over the years despite many predictions of major consolidations. Eutelsats business plans for its upcoming Ka-Sat launch have been unveiled. Ka-Sat, currently in the last stages of construction at the EADS-Astrium facility in Toulouse, will be launched from Baikonur as part of an ILS/Proton mission this December to 9 degrees East, and Eutelsat plan to start commercialising the craft by April next year. Millions of people die every year from preventable diseases, such as malaria and cholera. Pandemics put the world population at risk and have the potential to kill thousands and cripple the global economy. In light of these dangers, it is important to make use of technologies that can help address these issues. The data and imagery gathered by environmental remote sensing satellites can be used to develop models that predict areas at risk for disease outbreaks. These early warnings can help decision makers undertake preventive and control measures. Radio Frequency Interference is a persistent and growing problem for SATCOM network operators. Industry groups such as the Satellite Users Interference Reduction Group (SUIRG) have reported that signal interference significantly impacts margins, Quality of Service (QoS) and operational efficiency. In addition, it is estimated that the impact of interference on a relatively small satellite fleet can cost an operator more than $1 million per year. Modern SATCOM interference geolocation systems employ differential time and Doppler measurements taken in the satellite downlink to produce geolocation estimates of uplink sources of interference. Recent advancements in geolocation system features and capabilities have expanded the use of these systems into new domains. It is an exciting time for geolocation use as the market increases in size with new applications. For some years now, Colem has been heavily involved in the Satellite Users Interference Reduction Group (SUIRG) and in November 2009 Colems Director, Martin Coleman, was named chairman of the Video Carrier ID working group. Carrier identification is now a key and practical initiative being rolled out. For the rest, Martin Coleman explains the thinking behind the initiative and why if you havent signed up already, you really should. Walter Thygesen, MSc (Engineering), MBA, has been with Thrane & Thrane since September of 2007. He is also the Chairman of the Board of Hewlett-Packard Danmark ApS and The Danish Fund for Industrial Growth. In addition, Mr. Thygesen is a member of the Board of Novozymes A/S and of Royal Unibrew A/S. Clifton L. Cooke, Jr., served as Executive Vice President of Kratos Defense and Security Solutions. Prior to its merger with Kratos, Cliff was President and CEO of SYS Technologies, an $80M provider of information connectivity solutions that capture, analyze and present real-time information to the Department of Defense (DoD), Department of Homeland Security, other government agencies and large industrial companies. Cliff also served on the Board of Directors of SYS. Previously, Cliff was founder and CEO of VisiCom Laboratories, which provided embedded real-time products and services to industry and government customers. VisiCom grew to over $50 million in revenue before being acquired by Titan Corporation, where Cliff subsequently served as Executive Vice President. Prior to starting VisiCom in 1988, Cliff was founder and CEO of Advanced Digital Systems (ADS), which provided engineering services for DoD satellite programs. Cliff received his bachelors degree in Applied Physics and Information Science from the University of California, San Diego. Since 1995, Mr. Pieczynski has held a series of senior-level positions on Delta launch vehicle programs for McDonnell Douglas, The Boeing Company and, most recently, United Launch Alliance (ULA) that included responsibility for engineering, manufacturing and launch site activities, as well as contractual and financial matters. From 1995 to 2002, he served as the Program Manager for the deployment of Iridium low-Earth orbit communications satellites aboard Delta II rockets. In 2002, he was promoted to Director of U.S. Air Force Delta II Programs, overseeing the launch of military spacecraft for the U.S. Department of Defense and its agencies such as the National Reconnaissance Office, Defense Advanced Research Projects Agency and Naval Research Laboratory. For the past 15 months, Mr. Pieczynski served as the Delta Program Site Executive in Southern California, overseeing a workforce of over 900 ULA employees. He was responsible for coordinating the transition process for the ULA employees at the Huntington Beach location while all Delta rocket programs were being moved to ULAs new Denver, Colorado, location. Orbital then named Mark as the Vice President of the companys new Southern California Engineering Center in Huntington Beach, California. In his position, Mr. Pieczynski will oversee the technical support provided to Orbitals various launch vehicle and space systems programs from the companys newest facility, as well as being responsible for on-site staff management and development. In particular, Mr. Pieczynski will support the companys strategic goal of evolving the new Huntington Beach engineering facility to be a center of excellence for liquid rocket propulsion. AeroMechanical Services Ltd. (AMS), a provider of data and voice communications services for the aviation industry with its Automated Flight Information Reporting System (afirs), and Iridium, have demod the ability to capture and continuously stream in-flight position and performance data from an aircrafts flight data recorder (FDR). Using an operating mode of afirs known as FlyhtStream, the solution combines onboard smart electronics technology, a satellite constellation with fully global reach, including over the Poles, and secure, Internet-based data delivery to end users. If something abnormal occurs during an aircrafts flight, the system triggers an alert and begins streaming operating performance data via Iridium to designated recipients, including airline executives and ground support crews, aircraft and engine manufacturers, air traffic control, and search and rescue. A New Approach To Disaster Response, author: Paul Krzystoszek, Operations & Marketing Manager, Australian Satellite Communications (ASC). When a disaster hits, the toll on human life is often determined by the speed of response efforts. Recent catastrophes around the world have consistently shown that the 72 hours following an event are when the most lives are saved or lost. Its no surprise more governments and Non-Government Organizations (NGOs) are shifting their focus from disaster relief to disaster preparedness in order to accelerate response times and give potential victims around the globe the greatest chance of survival. Nestled in the rolling hills of Southern Ohio and home to more than 40 alpacas, Harmony Ridge Farms is typical of most American small businesses in rural areas. Though small in size, it needs the same caliber of high-speed Internet access as a large business to stay competitive in the marketplace. For its owners, Jeff and Marie Bradford, their older dial-up Internet connection made it extremely difficult to manage livestock purchases, register for shows, and organize deliveries, let alone attempt any sales and marketing email campaigns. The YEAR IN REVIEW � 2010 company article table of contents, in alphabetical order.